Pot-bellied pigs generally have voracious appetites and will eat nearly anything that you offer them. Unfortunately, they are also very prone to obesity which can lead to foot and joint problems, as well as other health issues. In addition to the health implications, they can also become very persistent and pesky beggars for foods they shouldn't have and can even learn to open the refrigerator in their search for tasty treats. Thankfully, by learning what a pig should eat, feeding the proper food, limiting treats, and developing a feeding routine, you can help prevent these problems with your own pig. Mazuri (whose parent company is Purina) - Three different foods exist from this popular food line for three different age groups of pigs - youth, adult, and elder. This brand of food is often used in zoos. If you feed a commercial food meant for farmed pigs then make sure you choose a maintenance ration (and especially avoid the grower and finisher type foods which are meant for optimum growth and are too rich for pot-bellied pigs). 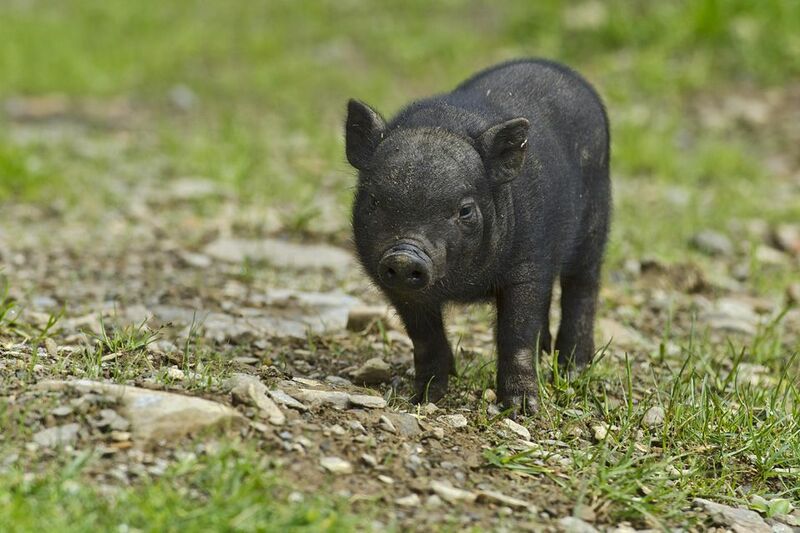 Young piglets can be fed a commercial pig starter diet, but only until they are about 2 to 3 months of age. As a basic rule in non-breeding adults, feed about 1/2 cup of maintenance food per 25 pounds of the pig's weight (so a 75-pound pig would get 1 1/2 cups of food). The total amount should be divided into 2 meals a day. However, this amount is just a guideline and should be adjusted based on the pig's body condition. If the pig is developing rolls of fat around their face and you have a hard time feeling their hip bones, your pig is becoming obese and should be fed less. Conversely, if the pig feels skinny you should feed more. Piglets up to 6 weeks of age can be fed the starter ration free choice (as much as they want) but from 6 weeks to 3 months of age gradually limit the starter food down to about 1 to 1 1/2 cups per day. Nearing 3 months of age, make the gradual change to the adult diet. In addition to the formulated diet, you can feed a good variety of fresh vegetables to make up about 25% of your pot-bellied pig's diet. Foods such as celery, cucumbers, peppers, carrots, potatoes, and some greens are good choices (but try to limit the starchy vegetables like potatoes). Some fruits can be feed as well but only in moderation due to the high natural sugar content. Most pigs love treats like apples, grapes, and raisins, but these are good to reserve as treats to be used in training (as they are very motivating). Extra fiber can be provided by feeding hay (e.g. alfalfa) and some experts recommend adding bran to whatever your pig eats. Do Pot Bellied Pigs Graze on Grass? Pigs should also be allowed the opportunity to root in soil and graze on grass (not treated with chemicals or fertilizer). Pigs are susceptible to selenium deficiency (since many pig owners do not give their pigs adequate grazing time) but in most areas, if they are allowed to graze and root in the soil they will get enough. If you live in an area with soil deficient in selenium you may need a mineral supplement. Check with your local pot-bellied pig veterinarian for advice on this. Feed a diet specifically made for pot-bellied pigs along with fresh veggies. Do not overfeed your pig. Never feed "as much as they will eat in a sitting" since pigs have voracious appetites. Do not feed dog or cat food (it is too high in protein). Avoid feeding fatty foods, particularly animal fats. Absolutely avoid feeding chocolate or salty snacks. Ensure plenty of fresh water is always available to your pig. Do not give into begging or your pig is likely to become a pest and beg constantly. Do not feed directly from the fridge or your pig may quickly become an expert at opening it. Let your pig graze on grass and root in soil. What Can You Use on Your Pot Bellied Pig's Dry Skin?